What if scientists were choreographers creating dances like the Genome Shuffle trying to answer the following. Who am I? Where did I come from? How long do I really want to live? These are questions raised by Ferocious Beauty: Genome, a two-act modern dance and performance art piece by Liz Lerman and her multi-generational dance troupe with genetic and molecular scientists as advisors. The premiere occurred in 2006 at Wesleyan University where the company developed the work over a three-year period. Lerman has been taking her company around the United States to perform this work that incorporates movement, music, imagery, and the spoken word. What’s surprising is that not only are there filmed interviews of talking heads scientists, but some of those scientists get involved with the dance. For example, one scientist sits and catches dancer after dancer in his lap while he talks. Another scientist, who attended the April 13, 2008, performance at Montclair State University’s Kasser Theater and participated in the talk back, peaks out of projected video panels in a set of shy movements that become part of the Lerman’s choreography. What this reviewer liked about this work was its inclusive community (adult dancers of all ages and one physically challenged dancer who enters on crutches as well as the surprise element of scientists getting involved with the dance). The diversity spoke well to the subject matter. 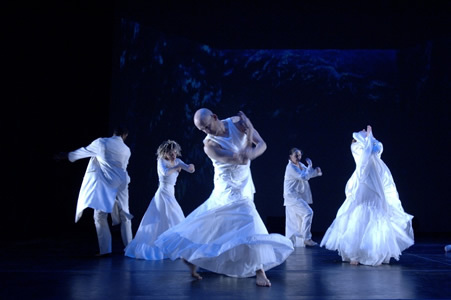 Lerman calls this attempt to make both genetics and modern dance understandable “nonfiction dancing.” The quest to understand genetics led to a Michigan residency that included the planting and filming of peas growing for her segment on the “Father of Genetics” Gregor Mendel, The result of the overall work was that she and her company learned about scientific method and the artistic process. Moments that stick in memory from this work are the lecture by Miss Tata (Elizabeth Johnson)—the luscious whip-cracking science teacher (TATA is a DNA binding protein), the frantic pushups by slender white-haired senior (Thomas Dwyer) trying to push past the inevitable, the apple peeling by the grandmotherly Martha Wittman who wears a saucepan on her head as she muses about the apple and DNA, the unzipping of the dancers’ costumes to read messages written from scientists on their bare skin (Mistakes permit change. Change equal evolution. Evolution requires time.) And although this reviewer remembers flashes of swing dance moves, the overall sum of Ferocious Beauty: Genome was less about dance and more about imagistic concepts related to genetics. Possibly the work could still use some pruning and rethinking. A projection of scientist names working in the field of genetics rolled on beyond this reviewer’s patience but then disintegrated in an animated chaos where all the letters piled up in an unreadable jumble of whiteness. Act I ends with a folk tale of a young man named Jack who traps death in a sack to save his sick girl friend. The story picks up again with scientists analyzing this folk tale as Act II opens but this reviewer found that ending of Act I not so much a teaser to come back to see the next act but more an unsatisfying way to tie up the run of subjects and images amassed in Act I.
Lerman, who in 2002 received a MacArthur “Genius Grant” Fellowship, amassed an accomplished support team for this work that includes projection designer John Boesche, lighting designer Michael Mazzola, soundscape artist Darron L. West, video and effects editor Logan Kibensand, and costume consultant Kathleen Geldard. Ferocious Beauty: Genome is a big work on topic that continues to get a great deal of press coverage such as these articles published in the Washington Post’s Sunday Outlook section on April 13: “By Design: Building Baby from the Genes Up” and “Animals and Us, Not So Far Apart.” Undoubtedly, Ferocious Beauty will receive many more productions and is worth the time to see and think about but it isn’t great dance.